Ben Anderson is currently the Okaloosa County Tax Collector, a constitutional officer, appointed by Governor Rick Scott in August of 2011 and reelected in 2012 and 2016. During Ben’s tenure as Tax Collector, he has implemented vast changes in technology and innovation to better serve the tax payers of Okaloosa County. He is responsible for six offices that employ more than 75 employees, including offices on Eglin AFB and Hurlburt Field, the first and only such offices located on Air Force installations. Under his guidance they are responsible for the collection and disbursement of more than $250 million and the processing of more than 640,000 transactions yearly. Furthermore, the Tax Collector’s Business Collections Department streamlined the Business Tax Receipt process, reducing the number of categories from 333 down to 2 options and ultimately easing the burden on business owners and creating a single cost for the license. In 2013, the Tax Collector’s Finance Department received the prestigious, Award of Excellence in Financial Operations and the Legacy Award in 2014, 2015, and 2016, from the Florida Tax Collector’s Association. Nominees from throughout the State were judged by a five member panel in the areas of competency in Innovation and Automation, Audit clear of any findings, Customer Focus, and Budgeting Expertise. Ben is active in the Florida Tax Collector’s Association where he’s held numerous positions. Most notably he was the Education Committee Chairman where he championed the Virtual Resource Network, providing much needed continuing education to tax collector offices around the State. Through his initiatives, more than 1,600 personnel from 44 counties have completed over 24,000 online courses. Currently Ben serves as the President of the Association. Prior to becoming the Tax Collector of Okaloosa County, Ben operated Anderson Realty USA. In his professional career, he became a State Certified General Real Estate Appraiser for both commercial and residential properties, and was also a licensed Real Estate Broker and Auctioneer. 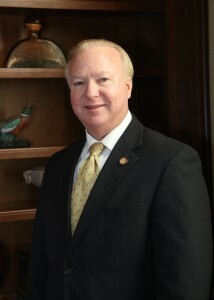 He served on numerous local, State and national committees, to include President of the Emerald Coast Association of Realtors, District Vice President of the Florida Association of Realtors and culminating in his selection as Director of the National Association of Realtors which is over one million members strong. Anderson graduated from Florida State University in 1973 with a double major in International Affairs and Government. He served four years on the Public Service Commission Nominating Council and also as a Legislative Aide in the Florida Senate. A lifelong resident of the Emerald Coast, he and his wife Karen have three grown sons, Justin, Jerrett, and Tucker; and seven grandchildren. Their Families are members of First United Methodist Church of Fort Walton Beach.